Ask anyone alive in 1969, and they'll all tell you exactly where they were when Neil Armstrong took that historic step onto the moon, on this very date 43 years ago! Astrophysicist Neil deGrasse Tyson today commented this was "the only positive event in the last 50 years for which everyone remembers where they were when it happened." Indeed! We need more such positive accomplishments; to return to the moon, go to asteroids and take that next breathtaking step onto the rust-red soil of Mars! Not one day in the far future, but to go to the moon and an asteroid as JFK said "in this decade" and go on to Mars in the mid 2020's. Our space program is indeed "American Exceptionalism" defined! It all started at the US Capitol 51 years ago when President Kennedy challenged our nation to go to the moon; "I believe that this nation should commit itself to achieving the goal, before this decade is out, of landing a man on the Moon and returning him safely to the Earth." 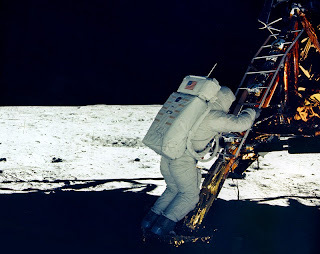 The nation rallied in support, and just eight years later made history for all time as Apollo 11 blasted off with Neil Armstrong, Buzz Aldrin and Michael Collins, travelled a quarter of a million miles, and the lander descended to the surface of the moon. 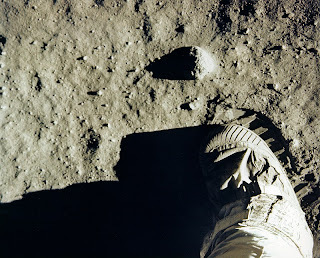 Neil Armstrong announced the landing with these words, "Houston, Tranquility Base here. The Eagle has landed." Few understood how close to disaster the astronauts were, for Armstrong had to take manual control and use up almost all the fuel to avoid boulders. That's why we sent the "Right Stuff" to the moon! Then Armstrong descended the ladder as the world held its breath. Everyone who watched, including your author from his house in Washington, DC intently watched as Armstrong spoke, "I'm going to step off the LEM now." His words echoed around the world as he took that step which will remain one of humanity's greatest achievements: "That's one small step for a man, one giant leap for mankind." What were YOU doing on that date; your thoughts, emotions and memories? For those too young, what were your thoughts when you first learned of or saw videos of the landing? Please share your comments on this page! I'm really sad with the way the manned missions was cut off, it's clear that the main problem is the lack of understanding of the importance of space exploration, either by the presidents that follow Kennedy and the general public. In fact it was better than could be, we send probe to Titan, lot of Mars exploration and frequent space station missions, that's good but i really miss the manned outer space part. We would already have a base on the Moon, i think that's the obvious next step, astronauts would stay much longer on the moon because it have gavity, lowering the bone loss and eyes problems, at least one year per crew i guess. The next step after moon base would be a manned Mars mission, followed quickly by a Mars base. We have no real space program today because Barry O. needs that money to spend on his social programs in order to win (buy) votes. Secondly, remember, our Marxist-Muslim president told NASA to "outreach" to the Muslim world in order to raise their self-esteem. What a pathetic loser our president is.